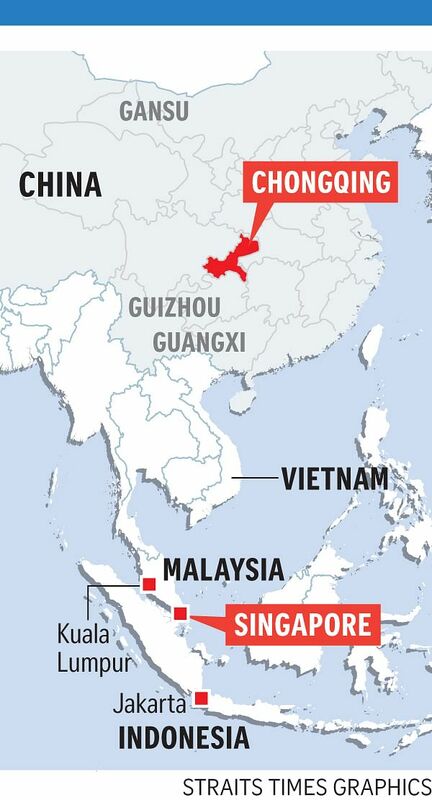 The Chongqing Connectivity Initiative (CCI), a joint project between Singapore and China, has expanded its network. Three more Chinese regions have come together to partner south- western Chongqing in the initiative, bringing the joint project one step closer to meeting a key objective to boost growth in the less-developed western area of China. "I am very encouraged that they understood the concept and are committed to join us in this venture, so that everyone can benefit from the CCI, and not just between Singapore and Chongqing," said Minister in the Prime Minister's Office Chan Chun Sing yesterday. He was referring to the agreement that Chongqing city, Gansu and Guizhou provinces and Guangxi autonomous region signed on Thursday to integrate Customs, data and financing for transporting cargo by rail along the Southern Transport Corridor from Beibu Gulf (Gulf of Tonkin) to Chongqing. They have also pledged to bring down logistics costs in the region by encouraging more trade through this new route. "The Chongqing leaders see this as a start, not the end, because the more regional partners they can bring together, the greater the economies of scale," Mr Chan told Singapore reporters yesterday. He said Guangxi party boss Peng Qinghua and Guangxi chairman Chen Wu expressed strong support for the Southern Transport Corridor in a meeting with him yesterday. The leaders understood how it fit into their national priorities set by Chinese President Xi Jinping and how it benefited them at the local level by helping them boost the regional economy, said Mr Chan. He added that one official told him the focus used to be on attracting companies to build factories. But increasingly, local governments are realising that while the hardware investment is necessary, it is not sufficient. "In order for the whole economy to work, you have to work on the aspects of logistics and supply chain and the non-tangible aspects of data and financial integration. And that's the essence of the CCI. "It's not just about connecting up the tangible parts, it's also about connecting the intangible parts," Mr Chan said. Launched in November 2015 during Mr Xi's visit to Singapore, the CCI is the third government- to-government project between the two countries after the Suzhou Industrial Park and the Tianjin Eco-city. When asked if the project has been affected by the recent leadership change in Chongqing, where the former party chief Sun Zhengcai was abruptly removed and placed under investigation, he said both sides "work very well without missing a single beat" due to the strong institutional foundations that have been built up over the years. He said he had "positive chemistry" and a "very good" first meeting with new party chief Chen Min'er. Mr Chan travels to Guizhou, another key node in the Southern Transport Corridor, to meet local leaders today before wrapping up his four-day visit to China.